Localisation of aid, partnership, and capacity strengthening are increasingly prominent issues within the humanitarian sector. 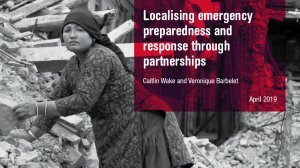 Calls for localisation are particularly strong in the disaster-prone region of Asia, with governments responding to humanitarian crises, such as those in Indonesia, Myanmar, Nepal and Bangladesh, limiting the access of international NGOs while encouraging (or requiring) them to work with local organisations. The trend towards greater localisation has led many international stakeholders to reflect on their own organisational structure, and their approach to partnerships and capacity strengthening, and how these may need to adapt in response to structural changes in the humanitarian sector. It is within this context that Islamic Relief conducted the project 'Strengthening Response Capacity and Institutional Development for Excellence' (STRIDE), which aimed to 'improve efficiency and effectiveness of Islamic Relief’s humanitarian response' in the Asia region. The project provided an opportunity for Islamic Relief to take concrete action towards its global policy commitments regarding localisation, while also identifying and strengthening their own capacity and filling capacity gaps in emergency preparedness and response. In 2018, following the completion of the first iteration of the project, Islamic Relief Worldwide commissioned the Humanitarian Policy Group (HPG) to conduct a study reviewing outcomes and learnings from STRIDE. These, along with the broader implications of the project and for the humanitarian sector, are detailed here.